You are here: Home » MEDIA » Books » Al Plastino: Last Superman Standing by Eddy Zemo (book review). 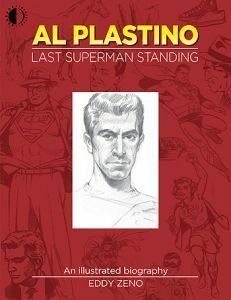 Al Plastino: Last Superman Standing by Eddy Zemo (book review). After Jerry Shuster, there were three significant artists in Superman’s early comicbook life: Wayne Boring, Al Pastino and Curt Swan. Plastino was told to adopt the style of Wayne Boring so the transition between them wouldn’t be too obvious. As seen from other samples in this book, Plastino could draw and ink in all number of styles. Indeed, as this book progresses, drawing comics paid the bills but he could also work in a number of mediums. Don’t expect this book to be all about Plastino’s work at DC as he also worked at Timely early one and several newspaper strips after over the years. An important lesson he learnt as a freelance artist was to always have two different art jobs going at the same time so he was never unemployed. I think I often confused Plastino was Wayne Boring and Curt Swan simply because he couple ape their styles so well. Plastino says near the end of the book that the way you can tell the difference between himself and Swan was because the latter always drew his figures bow-legged. Seeing Plastino’s other work here and when he let loose as himself, it’s clear that he adapted to need but he was also the first to do many things for Superman. He drew the first Brainiac, gave Mr. Mxyzptlk his more impish costume and designed Supergirl, whose likeness was based on his wife. Giving the super-pets their cloaks wasn’t his idea but editor Mort Weisinger. He also drew the first Legion Of Super-Heroes, there is barely a mention of them and only one later drawing. When you consider the likes of the LSH was essentially a one-shot and move on under Mort Weisinger that would hardly be surprising. His ability to draw good likenesses also meant he was the artist who drew the Superman meets President John Kennedy story ‘Superman’s Mission For President Kennedy for Superman # 170 in 1964 that came out the week of the latter’s assassination. That in itself has its own story at the end, which you can read for yourself when it appeared for auction in 2013, and is now on show at the John F. Kennedy Presidential Library. I never knew that he drew the Batman newspaper strip for several years. Although some of his other lengthy newspaper stints are on characters less familiar to us in the UK, he also did ‘Joe Palooka’, ‘Nancy’ and ‘Ferd’nand’, when their creators died, matching their styles. There was a time when Plastino was being considered to do ‘Peanuts’ by the syndicate just in case creator Charles Schulz died having his first heart bypass surgery and had prepared some months work to be ready. Seeing samples here, Plastino could adapt to anyone’s style and wrote them as well. Plastino also drew the ‘Superman In The Jungle’ trading cards and because the company didn’t want to reduce the size actually did all 66 cards at the right size. Alfred Plastino died at the age of 92 and this book is a fitting memorial to his career both in comicbooks and newspaper strips. His ability to mimic many other artists styles but not swipe made him also singularly unique as well. Occasionally, I wished he’d drawn more in his own way. You can see it more in his paintings. An insightful biography that if you love the Golden Age of American comics you will want to read. « Einstein At Home by Friedrich Herneck translated by Josef Eisinger (book review).